We are treating public property in the False Creek area for Japanese beetle. Learn about the beetle, get tips, see the area affected, and report beetle sightings. Japanese beetle (Popillia japonica) is an invasive plant pest that was first introduced to Eastern North America from Japan in 1916. Japanese beetle, an invasive, regulated pest in Canada, has been found in the False Creek area. 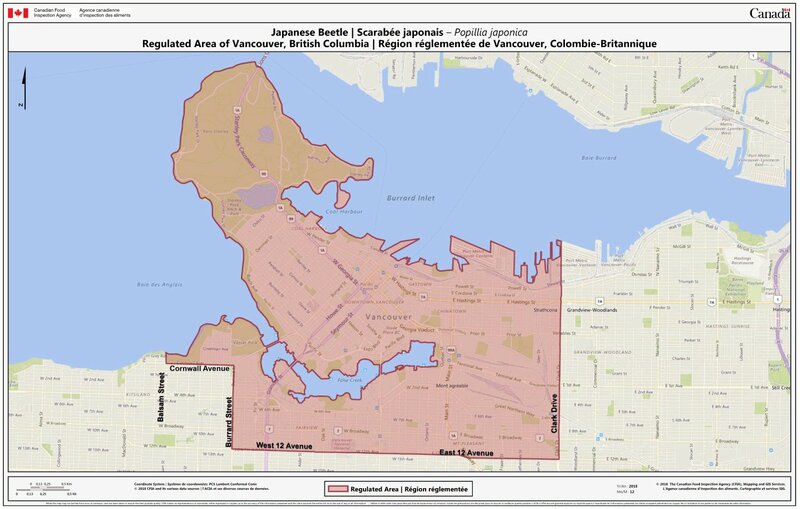 The Canadian Food Inspection Agency (CFIA) has issued an order for Vancouver which restricts moving plant and soil materials from outside a movement-control zone External web site, opens in new tab . Visit the CFIA website External web site, opens in new tab for a complete list of plant and soil materials that can and cannot be moved. Report sightings to the CFIA through their website External web site, opens in new tab . Attract birds by putting out a birdhouse and food. Japanese beetle larvae feed on the roots of lawns and other plants. Adults are heavy feeders, attacking the flowers, foliage, and fruit of more than 250 plant species, including roses, blueberries, and grapevines. The damage they cause is significant compared to other pests like European chafer beetles. Phone 3-1-1 for questions about the treatment plan for public land. View all other topics below to see which organization to contact.